This recipe joins ingredients I’d never imagined together. Think about a Chinese stir-fry with an American Southwestern flair. Canned creamed corn might send me running in the opposite direction, but this recipe was described as “brilliant,” and with Mark Bittman backing it, I took the gastronomic leap of faith and went for it. What a great stir-fry concoction it is! It’ll be a regular in my nightly repertoire from now on. The combination of creamed corn and fresh corn kernels is the secret to success. Mix the chicken with the soy sauce, the sesame oil, and wine. Season very lightly with salt. Keep at room temperature for 10 to 30 minutes (you can also do this step several hours in advance). Heat the vegetable oil on a large skillet, when very hot, drain the chicken and add to the pan, without crowding (if necessary, do it in two batches). Let it cook undisturbed until the pieces get a nice golden brown color, then flip them around to cook the other side. The whole process will take less than 5 minutes, if your oil was hot enough to begin with. Turn the heat down, add the garlic, ginger, and red pepper flakes. 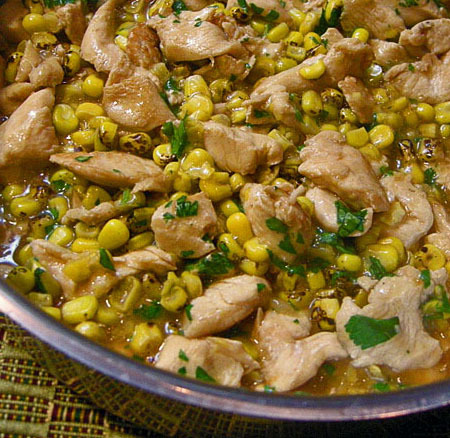 Cook for a minute, add the creamed corn and corn kernels (no need to defrost if frozen). Cook stirring every once in a while until the dish is heated through, about 5 minutes. Sprinkle with cilantro right before serving, preferably over white rice. Comments: Most stir-fries finish with a liquid thickened by some type of starch – usually cornstarch or arrowroot. In this recipe the creamed corn provides all the texture and substance you’ll need. I made it, start to finish, in less than 30 minutes on a weeknight, but in the future I might marinate the chicken early in the morning and leave it in the fridge the whole day.